Hi Jammers! This page is, as the name says, were I tell you about this blog. Also, on this page I would really appreciate comments telling me what you think about this blog or how it could improve. My objective with having this blog is not only having fun writing on it, but making jammers have something interesting to read. I also want to spread the culture of Jamaa. My goal with this blog is to turn it into the most viewed blog. That will be difficult because Animal Jam Spirit and snowyclaw are amazing, but I will try my best. 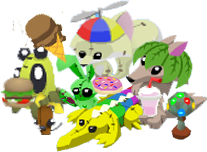 On 25 December 2011, Animal Jam Cheats and codes was created. 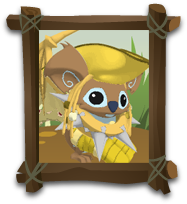 At first it was not very constant, full of big breaks, and the owner (AKA me) didn´t really know much about Animal Jam. That´s my old look, on my old account, when I was still a non member. On January 2012, I decided to try to improve my disastrous blog by adding two new authors to the blog: My good real life friends indio and Ainoa18. From left to right, me, indio and Ainoa18. I have to admit, this bllog was truly terrible until the begginings of summer 2012. Before that, AJCC was an unscontant blog and there were lots of "breaks". But in June 2012, I got my membership, and I decided to make a good use of it by making my blog better. So I have been trying hard to improve it sice then until what you see now. i love ur blog to death!!!! man it helped me with TONS of stuff!! you did a great job on it! my username is grandcanyon8 i'd love to be ur buddy on aj! buddy me! I KNOW RIGHT IT TOTALLY HELPED!! I CANT IMAGINE UR BLOG BEING HORRIBLE, EVEN IF U WERE A NONMEMBER! IM A NONMEMBER AND IM OKAY... A LITTLE... okay my blog SUX! PLZ! what does AJCC mean? AJCC means Animal jam cheats and codes. You guys are so right! DONT SWEAR PPL! It's not good... your giving ppl a bad future when you swear. Yeah, swear words are bad. I understand that when you're speaking it's easy to accidentaly swear without realising, but as you're typing, thats not an excuse. I agree with MisterChunkybuddy and MIsterChunkybuddy YOUR BLOG IS AWESOME!!!!! you typed a bad word!!!! Heck isn't a bad word..
Why you call nnn a bad word if you dont want bad words on here krystal girl? Mister chunky I suggest deleting all the comments about the , u no what I meant. Then I think no more should be said or heard of it. Wow! Cool!!!!!! I couldn't imagine this blog being horrible! Hi MisterChunkybuddy! This blog is pawsome, pawfect, and pawtecular, there is no part of this blog being pawful! i have seen and ive seen a lot. I am dying to meet you on aj because you are a great blogger and this is interesting and fun! I cant think of anything wrong with it dont ever stop blogging! Hey jammers never scam ...............my bow was scamed but a realy nice person gave me two rare items . NEVER SCAM PLZ.....SCAMING IS LIKE STEALING AND STEALING LEADS TO A BAD LIFE. My friend, Dubstepwolfeh, was scammed of her long black collar (rare) And I was scammed of my old Viking helmet. There is new codes! Kangaroo and Drawing!!!! I found those codes in theanimaljamexpert.blogspot Blog! There's also a code called "koala" in case you need to know also. Keep up the good work with the blog, it could only get better... right? I tried an AJ blog, and as the same, it mad a million brakes so I quit it. But you make me think I should make a new one, start fresh, and it'll all be ok! I'm doing that! Thanks for the motivation! You know what? I think this blog is awesome. I already have a fan (kangaroo540) who knows me from this blog. Also, I think it is awesome because you're nice enough to let people tell about their blog. I don't have one, but I still think it is nice. Improvements? You should make a tab where you post videos-- Mailtime, Scammer Busting, etc...-- and make it so that people can watch it. I think it would make your website more popular and "Random Fun". wow it's been 4 years! Anyway, that goes for everyone else too. SORRY IF I AM UN SATISFIED WITH YOUR OFFERS! I'm trying making a blog on E-blogger and I don't know how to make the pages! Could you help I totally don't know and when i try the thinga-ma-gig that says 'pages' it wouldn't chow up on my blog. I NEED HELP!!!!! Ok, you are in your rights to hate me, but don´t post swear words because there are little kids here. Don´t look at this blog if you don´t like it. I A CHRISTIAN ARE YOU, CHUNKY? Those names look mean.I mean who would like em,except you..
Why is it that when I saw "Mailtime" on Animal Jam, the "No Scamming" box thingy comes up? Try it, you'll understand what I am saying. I have no idea why they made this change, but I suppose people lie about the fact they're making videos. But anyway, someone accused me of scamming their red fox hat today... they said they sent it to me and they were asking for it back 0-0 I'm not going to give her user because I forgot it, but sometimes it's SO hard to prove that I don't scam. Yes, as many people use mailtimes to scam AJHQ don´t like them. Misterchunkybuddy, do you have a response to that? People are posting mean comments about people with bad language. This is really getting out of control. I mean, look at the comment above me. Then the one two above me, how mean it is to YOU and that other person. This is getting really bad. That's the only tweak you need to fix up on, otherwise this site is pretty much ok. Listen, guys. Thanks for the help, but I understand this situation quite well. I believe that what has just happened is a certain form of bullying used to discourage me and run away from this site and never post again. As much as that comment hurts my feelings, I am still going to stay strong, post comments and enjoy Animal Jam, and no Bully is going to ruin that. There is still justice to be served against this, but nonetheless, just ignore that anonymous' post about me and Misterchunkybuddy-- both of them. Thanks anyway guys! I will still be commenting every now and then, but only Misterchunkybuddy has the right to remove me from this blog. I am so sorry, thanks for warning me about that comment. Seriously, you must be really bored if you try and entertain yourself by doing those things. And leave shadowphase alone. If you hate this blog and misterchunkybuddy please leave this blog k? Dude, it's spelled OUR not ARE. You did that twice, bro. TWICE. POOPY MOUTH! POOPY MOUTH! POOPY MOUTH!! HE SWORE! STOP HIM! HE SWORE! Thanks you Misterchunkybuddy, though the problem is still continuing. I'm sure we all know that this dude is getting to a small... problem. Even a couple of people (such as anonymous above me) commented about what he did. If it is possible, you might be able to make it so that you can't type bad words or else it won't post. I don't have a blog, so I'm not sure if it's possible. BTW anonymous with the clans, I won't be surprised if you comment back. Don't try-- I'll be expecting it. Misterchunkybuddy, I have an idea for the Flashback Fridays! I think you should do a thing where you throw BIG parties that anyone can go to-- as long as it's not full. It would be nice, people could see your den, people would have a good time, and just hang. I also have another idea: Would if you make a Scamming Awareness club meeting? Last time I went to one of them, several people came and got to speak their word. I would just like to explain scamming to you. Scamming is like stealing, let me just say that first. When you catch someone stealing in real life, you call 911, right? and they take them to the police, right? and they go to jail right? and don't get to stay in their favorite town. Well, moderaters are the police, 911 is reporting, and jail is suspentions. so remember jammers, if you catch someone stealing, (scamming), call the police, (report them), and we can all make jamaa a better place,together, even if it takes one jammer at a time. thank you, and jam on! Ohh, I like that comment, weebieb. I hope it helps others understand scamming more. Blog.Its his own in a special way.Please comment back when you can Mister Chunky Buddy.From,(not real user) Mystery girl. Why am I suspended? I went onto my account to get a news scoop for my blog, and it said I was suspended ;-; I have no idea why. I don't scam, I'm pretty sure I don't say bad words, what could I have done? hai i love reading blogs and legends they put on i love this blog and the legends they are EPIC! How dare you guys say bad words!My sister (5 years old) looks at this blog all the time!and kept saying bad words to everyone!how dare u! Do you do RIM? I can't find it on your blog because I do and I thought I saw it on your blog and I was thinking "Ummmmm, RIM was kinda my idea ....." . Please reply. Oh and i forgot to ask you, when are you going to be on animaljam? I love your blog! !Please be my buddy!! I am a koala and my username is paws00001.I lovethe funny pics,and thanks to this blog,I have found everything in every world!Please keep this blog going! OMG I started this week on Tusday every since I was adored by your legends I love Greely's I think he is the only alpha that was born with powers but on AJ I'm ladybug7305 and please unlock you den . And also I would totally love a legend about Sir Gilbert he is my 2nd fave. IF THIS WEBSITE COST MONEY I WOULD PAY FOR IT!!!!!!!! OMG I AM IN LOVE WITH THIS SITE!!!!!!!!!!!! SQUEE!!!!!!!!!!!!!!!!!!!!!! Im starting a blog because of you. You are my insperation. You are epicly AMAZING. I love this blog, in fact, I'm starting my own at theallegianceofmira.blogspot.com, if you're interested, please visit! I love your blog so much! Could you please add me my username is Lilac670. Four words: I LOVE YOUR BLOG!!!!!!!!!!!!!!!!!! My user is cutiepie7071 please buddy me!!!!!!!!!!! MCB your blog make me so happy in jamaa! Now I happy and I don't care did I am member or no cuz I have your blog and that good for all of us that is non members! I ill find u in the game and buddy u but if I can't plz buddy me I am rorikiki! hello i as also alot of fans say i love your blog it is very cool i would also love to be your buddy i am loverocksforever247 look me up! Can you please write a story about how foxes came to Jamaa? I AM ADDICTED TO YOUR BLOG CANT STOP WATCHING IT!